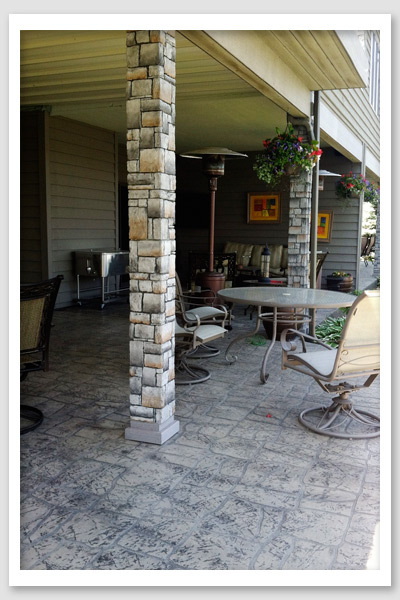 Custom Concrete & Design, LLC is a decorative concrete and regular concrete contractor located in Albert Lea, MN. We specialize in stenciled and decorative concrete. We also provide a full range of flat-work services that include pouring driveways, patios, sidewalks and floors. Custom Concrete has the knowledge, experience and tools to get the job done right. Custom Concrete and Design is a fully insured contractor* that is locally owned and operated. We stand behind our work and our number one goal is to make every customer happy. We have been serving the Southern Minnesota, Northern Iowa and the Minneapolis/St. Paul metro area since 2003. *Custom Concrete & Design, LLC always has an Owner onsite during any job we do. Stenciled concrete is a way of adding color, pattern and texture to a plain concrete slab at the time of pouring. The finished job has the attractive look of brick or stone with a contrasting grout line. Edges of plain, matching or contrasting patterns can be added and even applied to steps. Decorative features such as special designs, company logos, monograms, etc. can be incorporated into the paving. The main advantage of stenciled concrete is that a high quality finish and image can be achieved at a very reasonable price and in a relatively short period of time. Poured as a new area of concrete, a stencil is laid on the wet concrete. A color hardener is spread and troweled in, so that when the stencil is removed, a grouted paving pattern is achieved. The area is then washed down and sealed. The finished job is sealed with a protective coating which protects the concrete from dirt and stain and improves the overall strength. The area can be rough-broomed or an anti-slip finish can be applied to give the finished product traction in steeply graded areas. A release agent is applied over the color hardener to provide colorful and complimentary accents and texture. We offer snow plowing, sanding, and snow removal services for both our Commercial and Residential customers. Whether you require snow plowing for a driveway, parking lot, sidewalk or any other areas that require snow removal we are ready to clear the way for you. We offer twenty-four hour snow removal services that will have your home or business ready to go when you are ready to go! Click here to contact us about your snow removal needs.